In his ‘Inaugural Address’ at the national seminar on “Insurgency and Development” being organized by Centre for Jawaharlal Nehru Studies, Jamia Millia Islamia and Indian Council of Historical Research on 28-29 January, 2014 on Jamia campus, Hon’ble Minister of Rural Development, Shri Jairam Ramesh spoke about a fourfold approach to the problem of insurgency. He said that one must examine the historical factors, the political factors, the security concerns and the developmental aspects of insurgency affected areas. He also took on questions from the students and other delegate and answered their questions on Maoism, Government’s policies etc. His address was chaired by Prof SM Sajid , Vice Chancellor, Jamia Millia Islamia who said that there can be no universal solution to the pr problem of insurgency and that there are always local concerns which need to be taken into account. In the inaugural session, Prof Shahid Ahmed, Director, Centre for Jawaharlal Nehru Studies delivered the welcome remarks; Prof Savyasaac hi, Department of sociology, introduced the theme of the seminar. 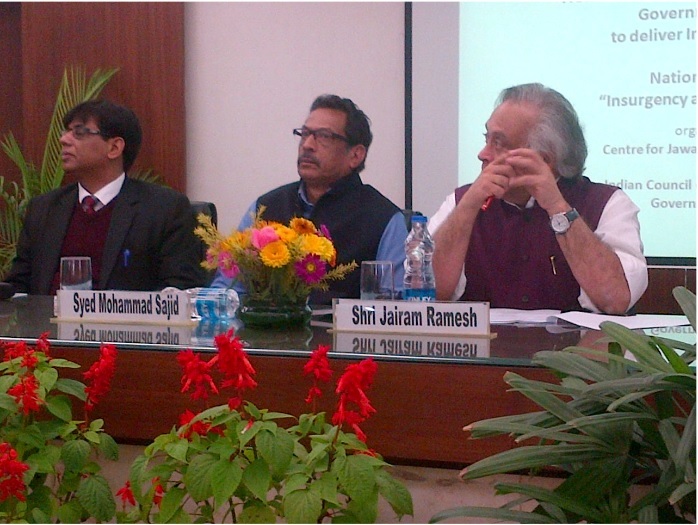 The inaugural session was held from 10 to 11 AM on 28 January, 2014 in the Edward Said Hall, adjacent to the Vice Chancello r’s Office, Jamia Millia Islamia. This session is being followed by a Panel Discussion , chaired by Prof Gopinath, Member Secretary of the Indian Council of Historical Research. The panelists in the session are Prof Nandini Sunder, Prof Sanjoy Hazarika, Prof Nasir Tyabji , Dr. Sudip Chakraborty, Ms. Meenakshi. Prof Amiya Kumar Bagchi, Chancellor, Tripura University and Emeritus Professor, Institute of Development Studies , Kolkata and Adjunct Professor, Monash University, Australia will deliver a Perspective Lecture on the theme of the conference from 2 to 3.30 PM which will be held in the Mir Anis Hall. The first session of the conference will be on political economy which will be chaired by Prof Shahid Ahmed, Director, Centre for Jawaharlal Nehru Centre and will include papers on issues of State Terror and FDI funded takeovers , Insurgency in different parts of India, Legal Intervention and the role of the Military among others. A parallel session chaired by Prof Manoranjan Mohanty, Council for Social development will include papers which will deal with Cartographies of Insurgency, the Red Corridor, and the Role of the Internet etc . The second day i.e. 29 January, 2014 will examine sociological aspects of insurgency and development and in the first session will have papers which will deal with unheard voices from Lalgarh , the Maoist movement , human rights issues etc. The second session will examine the Role of the Media . It will look at television, films and new media etc to examine the role that they play in representing the problem of insurgency. The third session will look at the regional context of insurgency and will look at the specifics of insurgency in Manipur, Kashmir, Assam, Orrisa, and other parts of the North East etc. The Valedictory Session of the conference will be held from 4 to 5 PM on January 29, 2014 in the Mir Anis Hall, where the Valedictory Address will be delivered by Shri Harsh Mander , Director, Centre for Equity Studies and Special Commissioner to the Supreme Court of India in the Right to Food case and Former Member of India’s National Advisory Council.